FILE - Investor Warren Buffett talks with CNBC's Becky Quick at PurposeBuilt2017, a national conference sponsored by the Purpose Built Communities group that Buffett supports, in Omaha, Neb., Oct. 3, 2017. 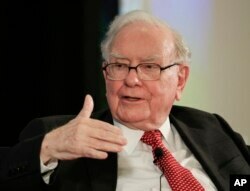 Buffett discussed what philanthropy can do to help fight poverty. FILE - Warren Buffett speaks with CNBC's Becky Quick at a national conference sponsored by the Purpose Built Communities group that Buffett supports, in Omaha, Neb., Oct. 3, 2017. Buffett said it’s important for people to invest money regularly regardless of the market’s ups and downs, but watch out for investment fees, which will eat away at returns.